Monkey Monday to you all, my little gingersnaps. You didn't notice I missed a week, did you? Okay, so maybe I needed a week to recover from Harry Potter and the awesome weekend with Laura. (the artist formerly known as Spank). We watched the movie. We brought an entire box of tissues with us, and yes, we did the ugly cry. We even made shirts for the movie. 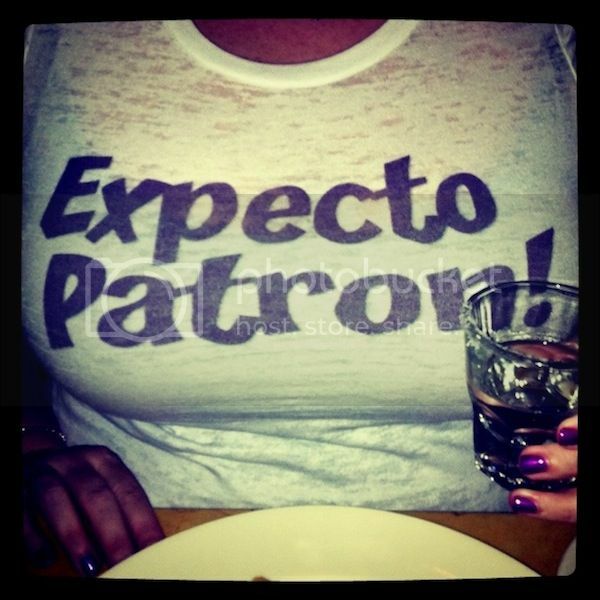 The Patron helped prepare us for the final movie. Anyway, if all of this Harry Potter stuff is confusing to you, here's Harry Potter re-enacted in under a minute by cats. Raise your hand if you're at Comic Con. *keeps hand down in my lap* Every year I say I'm going the next year and then I never get around to getting tickets. Shame on me. You know who is at Comic Con this year? 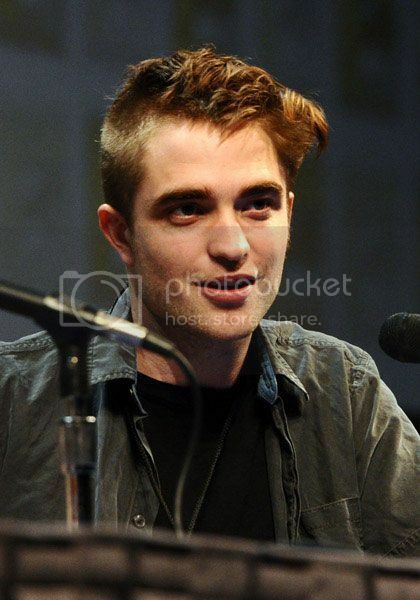 Robert Pattinson. Sporting this WTF haircut. No seriously, WTF? Who at Old Spice thought it was a good idea to replace Isaiah Mustafa with Fabio? Noooooooooooooooooo!!!!! The person who made that decision needs to go ahead and get their severance check so they can bring back Isaiah. Who on God's green earth wants to smell like Fabio? Who wants their man to smell like Fabio?? Hey, WTF??! And where can I find one of these for myself??! Psycho was the first American film to show a toilet being flushed onscreen! Though the toilet was never credited in the movie, our sources tell us that its name was ‘John’. Sadly, our porcelain friend was only given one line: “FLUUUUSH!” when Janet Leigh’s character was shown disposing of a torn-up piece of paper in it. It’s glorious debut was also upstaged a few moments later by the shower. LOVE your shirt & I those kettehs cracked me up!! I totally agree...Isiah was all kinds of yummy. *raises hand* Woop woop CC! **in the voice of Mrs. Weasley** "Where HAVE you been?!?!" Glad you took a week off. Howevs, when I'd check your blog every day or two and see the same "It All Ends" title, I started wondering if you were hinting the end of the blog to coincide with HP 14 & 1/2? Isaiah is sooooo dreamy. He was at a club here in Denver once for some theme night sponsored by Old Spice. We got a pic with him...lemme see if I can dig it up. I am so enraged by the Old Spice commercial that I want to go down there, find the person that made that decision and throat punch him. It had to be a him, cuz no woman in her right mind would replace Isaiah Mustafa. Seriously.